AFC Fylde’s star striker Danny Rowe has been named Vanarama National League Player of the Year. The Coasters hitman won the managers’ vote after taking the step up to the elited division of non-league football in his stride, plundering 24 league goals as Fylde secured a play-off place over the weekend. 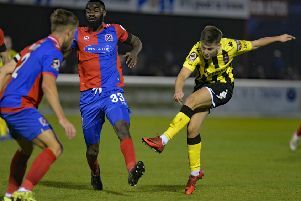 The many hightlights of the 29-year-old’s season included his 19-minute hat-trick in a 7-1 win over fellow play-off contenders Aldershot Town. Rowe also picked up the equivalent award in National North last sesason, when his 50 goals propelled the Coasters to title glory. The frontman etched his name into Fylde folklore in August, when his strike in the 2-0 win at Hartlepool United took him past Richie Allen’s all-time club goalscoring record of 119. Rowe, who is now just two goals short of 150 for the club, said personal accolades were the last thing on his mind. He said: “All my concentration was on getting into the play-offs. I was obviously delighted to get the award. I would have hoped to be in contention but there are a lot of good players in this league. “It has come from people who know a lot about the game and the league, so it means a lot that they have recognised my contribution. “For them to think I am the best player in the league is a huge honour. “I think my own personal season and the club’s season have been very similar. On both counts I think we could have done slightly better at first because we had a slow start. I didn’t score many at the very start of the season and as a team it took a little while to get going. “Overall, I think I have done well this year and to pick up the top award means I must be doing something right! “I am happy with my goal return but I always want to score more because I am my own biggest critic. Rowe finished second in the National League scoring charts, two behind Tranmere’s Andy Cook. After more than 500 AFC Fylde fans attended Saturday’s final league fixture at Wrexham, many taking advantage of the free coach travel laid on by the club, the Coasters are repeating the offer for Thursday’s far longer trip to Boreham Wood in the first round of the play-offs. Chairman David Haythornthwaite issued this rallying cry to the fans. “Thursday night at Boreham Wood on very short notice is not the best draw for obvious reasons, not least the need to take time off work which may prove difficult for many of our fans. “We covered the cost of coach travel to Wrexham last Saturday and as soon as our play-off opposition were confirmed Dai (Davies, president) and I decided we wanted to do it again. Although the match will be televised live on BT Sport, we need as many fans as possible to travel and be our 12th man. “We have already had lots of enquiries, so we have provisionally booked four coaches to take the fans and officials down. We plan to leave as late as possible on Thursday afternoon, so at least fans only have to take the afternoon off work, which at the moment is 1.30pm. The usual pick up points will apply. For bookings and details call 01772 598855 and ask for Gary or James.